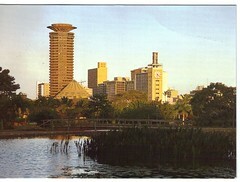 A postcard from friend Isabelle who lives in Nairobi. It shows a small part of the city centre as viewed from one of the parks. Next Next post: "Mevagissey" from an original water-colour by David Skipp.